Port Antonio is not your typical Jamaican holiday resort and is one of the less developed holiday destination in Jamaica. The larger holiday resorts in Jamaica are located to the west and especially along the north and west cost including Ocho Rios, Montego Bay and Negril. Port Antonio remain a agriculture town with a small tourism presence trying to maintain a foothold. Port Antonio is one of the few places in Jamaica that still have it's traditional Georgian architecture in the town center (Falmouth in the other) and simple town layout which lack the modern high rise buildings. This is one of the main charm of Port Antonio over the years, a chance to get away form it all and just be at one with nature. The lack of commercialization and industrialization have created an ideal marine environment for sea life. The waters around Port Antonio offer some of the most pristine diving conditions in Jamaica. The waters are not churn up with marine vessels and over exploitation - giving divers the chance to explore some of the best seascapes which very few humans have seen. Head out from the Errol Flynn Marina to one of the many dive sites around Port Antonio. You can enjoy the unspoiled coastline along the journey and admire the true beauty of Jamaica. Most of the dive sites are located close to a famous landmark in Port Antonio including Navy Island, Blue Lagoon, Frenchmans Cove and Boston Beach. 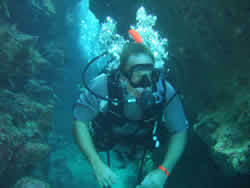 You can start your scuba diving experience in water around 30 feet and deeper for the more advance and expert divers. You will be accompanied by one of our dive master who will be your guide throughout your scuba diving trips. Our diving instructors have years of experience taking diving trips to the various dive sites around Port Antonio. They will ensure that your diving experience meet your expectations and that you have a great time. We provide you with a qualified Scuba Diving Instructor who have years of experience teaching and supervising dive trips. We provide all your dive equipment including tanks, diving suits (wet and dry suits), weight belts and flippers etc. You all get a fully equipped boat and crew, who will take care of you throughout your scuba diving trip and be your dive guide. Fish Species - These are some of the fish that you will see on your diving trip including the French grunts, blue striped grunts, trumpet fish, trunkfish, banded butterfly fish, angelfish, porcupine fish, grouper, flounder, parrot fish, puffer fish, goat fish, red snapper, yellow tail snapper, barracuda and lion fish. Coral SpeciesThe seas around Jamaica has so of the best preserved coral reef species including the staghorn soral, elkhorn coral, finger coral, pillar coral, starlet coral, brain coral, lettuce coral, cactus coral, star coral, atlantic mushroom coral, eusmilia fastiginia, atlantic mushroom coral, spiny flower coral, smooth flower coral, orange cup coral. Enquiry or Call: +1876 771 9612 for a no obligation quote! Ask about Specialties, Master Diver, Assistant Instructor, and Instructor Programs. 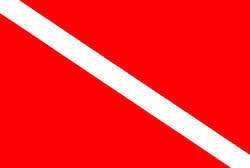 We offer pickup and drop off for our scuba Diving parties from the following Port Antonio hotels and villas. We also pickup from other holiday properties not listed here, just ask when you make your enquiry.